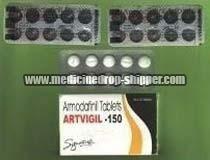 We are a giant Supplier and Exporter of Artivigil 150 Tablets in Maharashtra, India. We are backed by a team of adroit professionals, which meticulously examine them against the stringent quality parameters before forwarding them to our clients. These tablets are available in a hygienic packing, which helps in avoiding the chances of contamination. We are competent to deliver them in bulk quantities. We offer these tablets at a highly reasonable price.